Lawson Bates' "Past the Past" music video releases on Thursday, and that evening on Bringing Up Bates, fans will watch the budding country music star film the video with actress Sadie Robertson. Lawson also enlists help from his super-sized family to pull off this big project. For information on the meet and greet in Manchester, Tennessee, click here to be redirected to yesterday's post. I wonder why Lawson chose a song/video about high school girlfriend/boyfriend heartbreak, something that was far and away from the experience or reality for him, or any of the Bates children for that matter. It seems to lack authenticity or genuineness. Maybe that's what it takes to make it in the country music business- a mainstream approach. More power to him! I see where you are coming from on that. They are homeschooled, which means they don't understand high school life, and only one has ever been through a break up. But in the music industry most of the songs that people sing they didn't write and the ones they do they have other writers helping. He was not the only one involved in writing this song and who ever helped did experience the things he is singing about. This means he doesn't understand what he is singing about. But one doesn't always need to experience something to sing about it and put passion into the song. You are correct it does take doing songs like this to be in show business. If he didn't sing songs like this his career would go no where. As you said more power to him. You don't have to experience everything to have an understanding of it and to use your imagination. I am sure all of their friends are not home schooled, so it is very easy to talk to others about what they have gone through. Actually Nathan and Zack have been through a break up. Haha they're homeschool so that means they don't understand high school life? Yeah, I wish that were true. 7:27 The Bates do not approve of their children dating in any kind of traditional sense, even as adults. However, Lawson is clearly portraying himself as a high school football player with a girlfriend in the video. This is what has some people scratching their heads. Nathan went through heartbreak when his courtship ended with the girl in New York, can't remember her name. And many singers sing about topics that they themselves haven't walked but some of their listeners have. It's Ashley. She's lovely. And Lawson is neither Nathan nor Zach. I beg to differ. Can't sing about heartache and breaking up with a sweetheart when you've never had one. You are right. What was I thinking? Singers can only sing about experiences that they have had themselves. Smh. I was a little taken a back to see this video. It seems Hollywoodish a bit. What happened to just making a melody for the Lord? Lawson seems to be testing waters, or riding the fence. These families like bates/duggars slowly let more and more worldliness in. Too bad. They have a great platform to be examples, but they seem more worldly. Lawson isn't trying to be a coffee house performer. He is trying to become a country music star. Once he land's the Grand Ole Opry, he will be a good example of the Lord's following like others before him. @8:47?? Testing the waters or riding the fence with what? Surly you are not implying his faith? He has done absolutely nothing to even hint at that. Believe me, I've known plenty of Christians who were in Church every time the doors were opened, had their "honk if you love Jesus bumper stickers" every shirt, purse, and or jewelry had a cross, fish or Star of David with a cross in it, spoke only in Scripture, and yet I beg to understand why they were some of the most judgemental and prideful and quite frankly mean-spirited people I've ever known. Pharisitical..so happy they weren't like "those" denominations. ( Those were lengthy sermons as there seems to be a lot of "those"). I lasted 3 years then couldn't live up to their standards. Thankfully Jesus loves me, and I Him so we are good. My point is you can sing the songs and wear the paraphernalia, but it's your actions ( fruit) that says Christian. Lawson is a Godly man. I'm happy that he is at least trying to reach outside his Gothard/Fundamentalist ideology and reach a broader group. I love Sadie Robertson for that reason. Wonderful example of a young Christian woman for my daughters. Perhaps Lawson is realizing the same, and going beyond all the " we never..." to bringing the real love of Christ. Yes fruit may show you're a Christian, but can you please explain the "fruit@ of this video? Sadie Robertson is liberal, looks like the world, she was in dancing with the stars for goodness sake in very risqué attire, grinding against a man who is not her husband. Where's the fruit with these people? Please tell. Plus this music video is all about Lawson. There's no message of Christ. Are people. Ring saved because of his music? No. They're being led to believe that pursuing music to be famous, is ok for a Christian. Where's Christ in this? Where??????? Oh my goodness @11:30--give it a rest already. Obviously you watched Sadie "grinding against a man who is not her husband" so your actions would be absolutely no different than hers. Watching is a form of participating so there's that. The Bates and Sadie are already famous so again kind an irrelevant argument about pursuing fame. Sadie most certainly is not "liberal" in the sense you are insinuating. But if she is liberal enough to help reach a group of teens and young adults who would never have any interest in the mysogonistic, fundementalist, Gothard ideology then what a wonderful ministry by a wonderful young Christian woman!! In order to truly impact the world, you have to be willingly to leave the bubble. If Christians never ventured outside the church, it would be nearly impossible to reach those who don't know the Lord. I think what Lawson is doing is wonderful! He is a Godly man, with solid values, who loves the Lord and it shows in everything he does. He is down to earth and relatable and it is evident the Lord is going to use him to impact the lives of people who may have never set foot in a church or listened to Christian music, etc. He isn't a sell out, he isn't backsliding, he's using his platform to be a good example to others and Christ shines through him. Someone like Lawson is going to have far more of an impact, than a fundamentalist who most people can't relate to at all. I’m not saying Lawson’s music video is wrong. However, I agree with 11:30 that Sadie is not what I would think the Bates stand for. I DON’T watch Dancing with the Stars, but you don’t have to watch it to know that Dancing with the Stars is pretty risqué at times. Even if you didn’t know that she participated in Dancing with the Stars, I don’t understand how wearing clothes with huge gaps in the front and mini skirts while posing in magazine-type poses promotes what Lawson typically promotes. Not saying that making a video like this is wrong, but very odd, and I much prefer his original focus on gospel music. I thought he would lean toward recording christian music, because of his belief. Well Lawson does sing a little bit a country. I totally don't get this. Is it a movie? Is it a song? Though I like all the Bates, I'm a little confused why they'd want to make a video of a "breakup," and why they would promote someone who's pictures on instagram don't seem to follow the Bates same values. Lawson does a good job with his music, and I know in the past he's enjoyed videography, but this does seem a bit strange. No hard feelings, just seems slightly out of character. Do you know anything about Sadie Robertson and her values? She's one of the most influential young Christians in the country. I've seen Sadie's instagram. Adorable!! She is absolutely precious. So not understanding different "values" than Bates, unless you mean she dresses like a young woman her age should be dressing! Sadie is the true definition of a beautiful countenance. She doesn't need to draw attention to herself in goofy clothing to promote how "modest" she is. She's a modern day Christian woman drawing others to Jesus. Those are wonderful values. Of course I know who Sadie Robertson is, and I was not intending to be unkind in the original post. I’m not saying Sadie Robertson is WRONG, and I’m not saying I dislike what Lawson is doing persay. I just think that first off, the subject of the music video is not necessarily typical Bates style. It just doesn’t quite seem in character for a Bates, though I’m sure Lawson is just trying to expand his horizons. And yes, I was referring to the clothing/moral standards when I mentioned the difference in values. 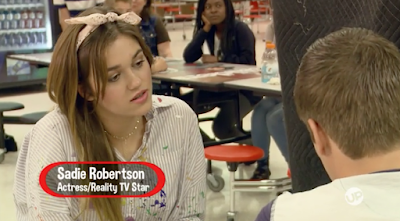 You must admit, Sadie Robertson is slightly more modern, and comes from a different background than the Bates. She wears shorts, sleeveless dresses, low cut tops, dances, wears stomach-showing shirts, mini skirts, and was on Dancing with the Stars in 2014. You can’t exactly say that Dancing with the Stars is something the Bates would watch or promote. Not saying they’re evil people, or that they’re wrong, I’m just noting the OBVIOUS differences in the Bates and Sadie Robertson and think it’s strange. I totally agree that wearing hideous poofy sleeve jumpers with socks and Sunday shoes or other weird outfits is not necessary to be a Christian or modest, but I think the Bates have better nailed the idea of modest modern. And, it is clear that Sadie Robertson doesn’t seem to have the same ideas that the Bates have when it comes to clothing, dancing, posing, and friends. No unkindness meant here, but I am noting differences with a bit of confusion as to what they are trying to accomplish through this video. Colton Dixon from American Idol sings only Christian music. I found this subject matter to be totally fictitious because of their beliefs about attending school and dating ANYONE. Why would Lawson record a video and a song about something which is against their beliefs? Just doesn't add up to me. I'd like to hear from him about this decision. (I personally think it's normal to attend school and have a social life; it helps develop character and 'high school break ups' help young people learn how to handle disappointment in life, which the Bates children don't seem to have any experience in due to their sheltered restrictions. Attending school and dating are not against his beliefs. They choose not to do those things for a lot of reasons but not because those things are sins. As far as we know, Lawson hasn't had a break up, but it is possible that he has experienced one. They don't show their whole lives on tv. Two of his brothers went through breakups, so I am sure he has seen firsthand how hard that is to go through. They have a social life. You don't have to attend school to go out with friends and do things. They attend homeschool conferences and church as well where they interact with a lot of people. Having so many people in their family, they probably have a better social life than most people. While I have no problem with Lawson being a country music performer and singing songs that are not just Christian, I don't in any way understand the premise of this video. Lawson has NEVER had a date let alone a girlfriend and break-up. He can't possibly be relatable in this area of life. He's a 25 year old man with zero relationship experience trying to sing and act about a high school ( public school at that!) breakup. Just not believable at all. So true, Anon 7:27. Homeschooled does not necessarily mean sheltered. The approach to teaching one's child at home varies from household to household, and some parents choose to be less restrictive than others. Believe me, it is definitely possible to be homeschooled and experience both high school and heartbreak. Lawson, please don't compromise in the quest to be famous. My slight criticism of this post is with the title. I think a better title would be "Lawson and Sadie's Big Breakup VIDEO." As the title is now, it seems to try to sensationalize and insinuate that they were ever a couple. It uses their real names (Lawson and Sadie) not any fictional names, which the video is telling a fictional story. From what I understand about Sadie, she recently broke it off with her boyfriend of two years. He's a college football player, so maybe this song/video is more about her experience and what she's learned from it. She's written about the volatility of the relationship. Many are saying that Lawson has never had his heart broken, or has even dated. Any thoughts as to maybe they don't show EVERYTHING on their show? Maybe there have been relationships or dates that aren't shown to the public. I'd hate to paint anyone as having no experience, when really, does anyone truly know?? I really loved "Freedom Sure Ain't Free" and "The End down here"! This song is just totally different to me, and i did not expect that he would make a song like this! I really would love him to make more songs that he used to do! Am I the only person who watched this and thought... wow, amazing song, awesome video, Sadie looks amazing. Give it a rest the Bates are not the duggers. Their children have choices and live as they believe God has planned. And in all these post not one word about how much charity he does. Keep singing Lawson, you have more fans than critics and thank you for being real and a Godly young man!